Several countries across the Europe and APAC such as Italy, France, China, and India have lately witnessed heavy traffic congestion and formation of smog owing to the growing number of heavy vehicles, two wheelers, and four wheelers. The governments of various countries in the region have taken steps and implemented policies to curb issues related to traffic congestion and emissions. One effective solution that has been implemented is encouraging the adoption of small-sized, compact, and lightweight two wheelers, hence triggering the sales of advanced two wheeler accessories. The public transportation system in Latin America, especially in Brazil, Argentina, and Mexico is infamous for charging high ticket prices. As a result of this, consumers in the region are shifting their focus towards moderately-priced two wheelers that are also compact and adhere to the prescribed emission norms. This is providing lucrative opportunities for vendors and OEMs operating in the global as well as regional two wheeler accessories market. High disposable income of both the middle and upper-middle class population in North America and Europe has led to consumers venturing into free-time activities that involve scooters and motorcycles such as off-road activities, bike stunts, and racing. This has in turn increased the demand for high-engine capacity two-wheelers as well as their aftermarket accessories. Moreover, the mushrooming of motorcycle clubs centered on cruiser motorcycles and popularized by famous motorcycle companies has triggered the demand for two wheeler accessories across these regions as well as in other parts of the globe. China is the most populated country in the world. The traffic congestion and rising smog formation in China is one of the leading reasons manufacturers are focusing on producing compact and lightweight vehicles. The government of China has imposed strict regulations in order to address various traffic and emission issues. This has led to a rise in the adoption of compact vehicles, thereby leading to a rise in the adoption of two wheeler accessories in the region. ASEAN countries have been witnessing high sales of conventional scooters and motorcycles for the only purpose of making transportation more convenient. Majority of the population in the region prefer two wheelers over four wheelers owing to the increasing traffic congestion on roads coupled with the need for easy and low budget traveling. 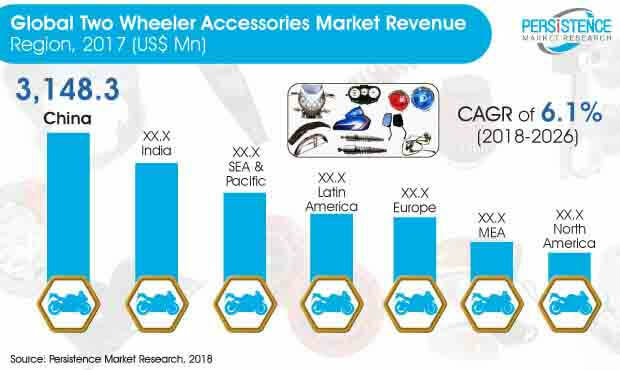 This is one of the key factors that has been accelerating the demand for two wheeler accessories in the region and this trend is expected to remain consistent in the coming years. Europe is famous for its rich colonial culture and historical locations, making the continent one of the leading tourist destinations in the world. Every year Europe witnesses a large number of tourists and this growing tourist population has triggered the need for two wheelers in the region to make travel and sightseeing more affordable and convenient. This has consequently led to a rise in the sales of two wheeler accessories. Steelbird Hi-Tech India Pvt. Ltd.